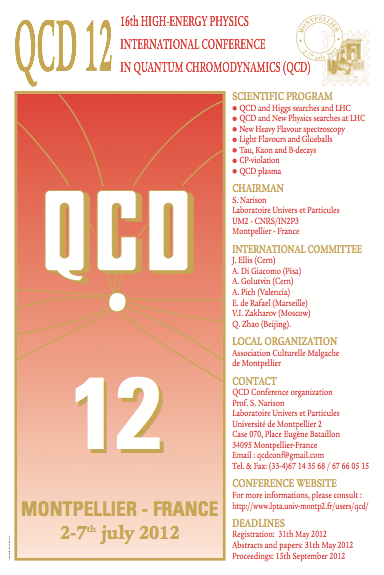 I have spent this week in Montpellier being a participant to QCD 12, a biannual conference organized by Stephan Narison. 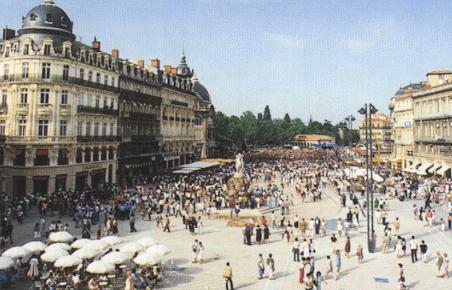 It is the third time that I go to Montpellier for this conference and there are always very good reasons for being there. Essentially, the quality of physics and beauty of the city are already worthwhile and sound arguments but also the excellent organization by the host and the attention reserved to the guests are not the least. 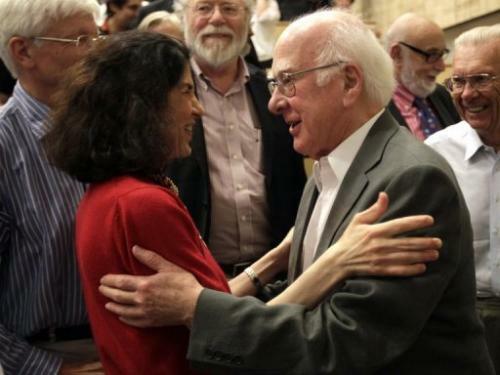 This year we have had the blessing of a historical event in physics: The discovery at CERN of the Higgs particle. Stephan organized the event with the webcast from CERN the first two hours on Wednesday and so we heard directly from Gianotti and Incandela what they were seeing at LHC. The conference is a fair interplay between experiment and theory in a field, QCD, that is very active and with several important open problems. Maybe, we would like to emphasize that is QCD that gives mass to everyday things, and not the Higgs boson, and this means that the solution of the mass gap problem and the developing of proper methods to manage non-perturbative regimes are essential to the understanding of our common perception of reality. Indeed, Roberto Mussa of University of Turin remembered us an argument that makes Higgs boson essential to everyday life: The stability of matter. Without the Higgs boson quarks would have equal masses and so, proton would decay into neutron. The difference in mass between u and d quarks is essential and this originates from Higgs boson. In this conference several questions emerged that were absolutely exciting. Hadron spectrum is not so well understood both in the low and high part. There is a plenty of experimental results claiming for an explanation. Labs keep on finding resonances that have not an immediate explanation and make hard the life of us theoreticians. One should compare the situation with the case of electromagnetic interactions where a Rydberg formula was promptly found and understanding of bound states is now quite straightforward. For hadrons we have hard times already to catch what the structure of a resonance is. These difficulties arise from the missing of technique to manage non-perturbative problems in a way similar to the weak coupling limit. Indeed, on Wednesday, some approaches were given to manage this kind of situation and, besides my talk, the most common technique is AdS/QCD starting from Maldacena conjecture. This was also the argument of Stefano Nicotri and Floriana Giannuzzi. They are students of Pietro Colangelo and contributed to the organization of Lecce conference. I have spent a lot of good time with them and so we exchanged a lot of opinions about this matter. On this line, Hans Günter Dosch put all us down showing that the situation with this approach is not so fine. Simply, it appears like a proper model for the mapping between gravity and QCD is lacking yet but, of course, people is actively pursuing it. A talk that gave me some interesting views was the one by Kenichi Konishi. He pointed out how the confinement can emerge looking at the behavior of the supersymmetric counterpart of Yang-Mills theory. He pointed out the problems with the idea of monopoles, already discussed by Kei-Ichi Kondo at Lecce. And you bet, when one looks at SYM one recover the condensation of a scalar field! Konishi works at University of Pisa where teaches quantum mechanics. On the line of non-perturbative approaches were the talks by Matteo Giordano and Enrico Meggiolaro. They are trying to re-derive from first principles the Froissart bound. This is a bound on hadronic scattering that can be obtained just using unitarity and dispersion relations. This bound depends crucially on the mass gap of the theory and so, again, we are coping with all the problems given above. Meggiolaro showed that, using lattice computations, the limit can be recovered with the proper constant while Matteo is approaching this problem using AdS/QCD. With Matteo we meet again in Montpellier after four years. We remembered each other immediately and drunk a last beer before leaving on Friday night after the social dinner, with Montpellier streets full of people and pleasant noise. A talk that I followed with a lot of interest was the one given by Pietro Falgari. He is working on the use of perturbation theory at high-energy in QCD to evaluate the production rate of pairs of top quarks. Even if in this limit perturbation theory can be applied in QCD, they have difficulties mostly related to resum a quite singular series with logarithmic contributions. So, also when perturbation theory applies, QCD does not save us from problems. With Pietro I have spent a lot of time in Montpellier and we left the city together on Saturday with the same flight. An interesting talk was the one given by Eduardo de Rafael about the determination of the g factor of the muon. This is a truly relevant matter as this measurement can give a clue to new physics. But, as de Rafael pointed out, the critical point is the determination of the hadronic contribution. Presently, there is a 3.6 sigmas discrepancy between the theoretical computed value and the measured one. We cannot be confident that the evaluation of the hadronic part is not correctly accomplished. Last but not least, the current work of Narison on heavy flavors with sum rules. This approach is now fairly well stable and provides results also better than other non-perturbative techniques. This has been shown in the talk by his collaborator Albuquerque from Sao Paolo. Of course, results like these should be a reference for experiments much in the same way are others as lattice computations. Finally, I would like to cite the talk by Robert Kaminski. He presented the fine work done in collaboration with R. Garcia-Martin J. R. Pelaez, J. Ruiz de Elvira aimed to a precise determination of the properties of f0(600) and f0(980). Their results are striking indeed as they fix very precise values to the mass and width of these resonances, in close agreement with preceding works. It is my personal conviction that a serious theoretical approach should be derive both the mass and the width of these resonances deriving at the same time their structure. Wednesday was the great day. There was a lot of expectation and the great discovery was in the air predated by a lot of rumors here and there. Our organizers did a great work both providing the webcast from CERN and with a pair of talks on Friday from people of CMS and ATLAS. There has been a religious silence during the talks of Incandela and Gianotti just interrupted by applause at the announcements of the 5 sigmas discovery by the two groups. Following this, we discussed a lot about this matter and, besides it is very standard model-like this particle at the moment, we all were very cautious to claim supersymmetry dead. Rather we would like to know more about the rates in the various channels, results to be known in the near future in order to answer the question put forward by CERN director Rolf-Dieter Heuer: Which one? A girl at my conference asked for other four Higgs and we all know why. Talking with a colleague at ATLAS here in Montpellier, he told me a quite interesting figure for the WW channel but I will not disclose it. Work is in progress yet and data are really too fresh to be discussed. It is a matter of few months and we will know better about the nature of this new particle. 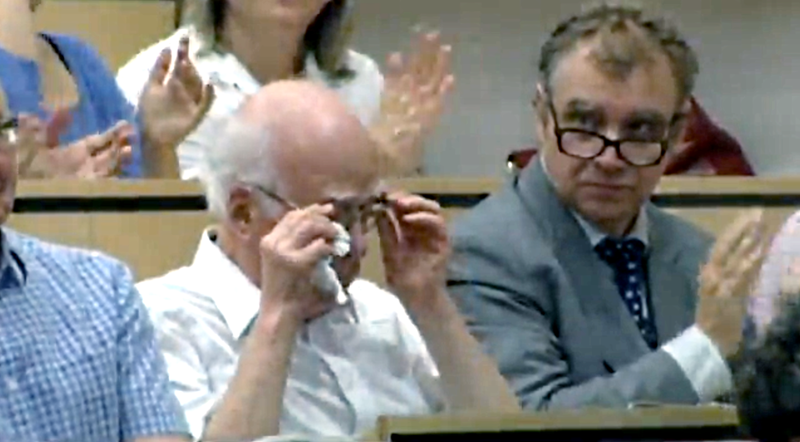 Meanwhile, I would like to remember Higgs’ tears after the great announcement and the handshaking with Fabiola Gianotti, after the splendid talk by her, confirming the expectation of almost fifty years of waiting with hopes often not coming up. It is an achievement that very few scientists can claim in their lifetime. The same must apply identically to Englert, Brout, Guralnik, Hagen, and Kibble. On Friday, the program was concluded by the talks of people from CERN, on behalf of ATLAS and CMS Collaborations. Pushpa Bhat from Fermilab talked on behalf of CMS Experiment while Robert Harrington from Particle Physics Experimental Group of University of Edinburgh talked on behalf of ATLAS Experiment. This was a great conclusion for the Conference, hearing directly from people at CERN, about the great achievement announced on Wednesday. As a final remark, I would like to thank all people with whom I shared beautiful moments at this conference. Besides people I have already mentioned, I would like to thank Stefano Venditti, Antonio Cassese, Andrey Tayduganov, Federico Mescia, Benjamin Obherof. A great thank goes to Stephan Narison for giving me the chance to give a talk here, for giving me the chance to be chairman for the first time, and for the excellent and really enjoying organization in a beautiful city. See you again! Update: Talks can be downloaded here. This entry was posted on Sunday, July 8th, 2012 at 9:37 pm and is filed under Conference, News, Particle Physics, Physics, QCD. You can follow any responses to this entry through the RSS 2.0 feed. You can leave a response, or trackback from your own site. OK, it may be a kind of Higgs field but what about the main thing, Higgs mechanism (actually Ginsburg-Landau)? Did you get your paper published? Not yet, It spent 18 months in Communications in Math Physics without decision. Prejudiced physicists have built a firewall against my paper. Unfortunately, they include Witten, Jaffe, and even L. Faddeev. The difficulty is that I have found myself between physicists and mathematicians camps. My non-perturbative infinite dimensional analysis looks foreign and difficult to both. The latest version “Pseudovariational operators and quantum Yang-Mills theory”(arXiv 1205.3187[math-phys]) presents my responses to physicists objections but appeals to mathematicians. Meanwhile I am giving talks on my theory and even got an invitation to publish it in a recent conference proceedings (in the Journal of Mathematical Sciences). Certainly, I believe in my work that goes mush farther than just the mass gap. How could you state that such prominent people blocked your paper? My personal view is that you should consider submission to standard mathematical journals like Annals of Mathematics and similar ones. You should find people better accustomed to your techniques. If you keep on trying in the mathematical physics area I fear you cannot get a proper ear to your instances. As you can read from most posts I wrote in my blog, as a physicist I have very mundane questions that appear from my data in labs or lattice computations. I need some tool to get them understood in a easy way producing just numbers to compare with them. Quantum field theory is just this tool but our current difficulty to fit it to QCD makes the situation really involved. Does the Higgs discovery impact how QCD lattice computations are done in any material way? These are somewhat different part of the Standard Model. The only way Higgs field can enter in QCD is through its determination of quark masses that one can take as a fixed value from the start. The main question, how QCD resolves the observed spectrum is yet there fairly successfully approached with lattice computations (a 1% agreement is generally claimed). Lattice computations are performed just taking the QCD part of the Standard Model and nothing else is needed. This a world where quarks are all stable particles.